The structure of a Green Heron’s foot lends itself to a life of wading at the water’s edge while foraging for food and not sinking into the sand. Three long toes pointing forward and one pointing backward create a considerable amount of surface area, and the more the surface area the less pressure that is placed on the sand. Webbing between its outer toes adds to the snowshoe effect (and also aids the heron when it dives below the surface of the water for prey and must swim back to shore). This foot structure comes in handy when wading in shallow water, standing on emergent vegetation or perched a low-hanging branch at the water’s edge. As testimony to this, the pictured Green Heron spent an entire morning navigating from water lily pad to water lily pad foraging for fish, insects, frogs and other aquatic life. Most owls have feathered legs, but the feet and toes of some owls, especially those living in colder, higher latitudes, are also densely feathered. The feathers keep the feet of these birds warm, allowing them to hunt where snow is on the ground and temperatures are very low. Great Gray Owls (pictured), Snowy Owls and Northern Hawk Owls are all examples of this phenomenon. Owls living in warmer climes, such as Barn Owls, have sparsely feathered feet and toes, and tropical owls have nearly featherless feet. This variation can also be found within a given species that has a range that extends over many degrees of latitude, such as the Barred Owl. Virginia opossums have expanded their range into northern New England, but are still not commonly seen, except, perhaps, lying on roads where they met their demise. 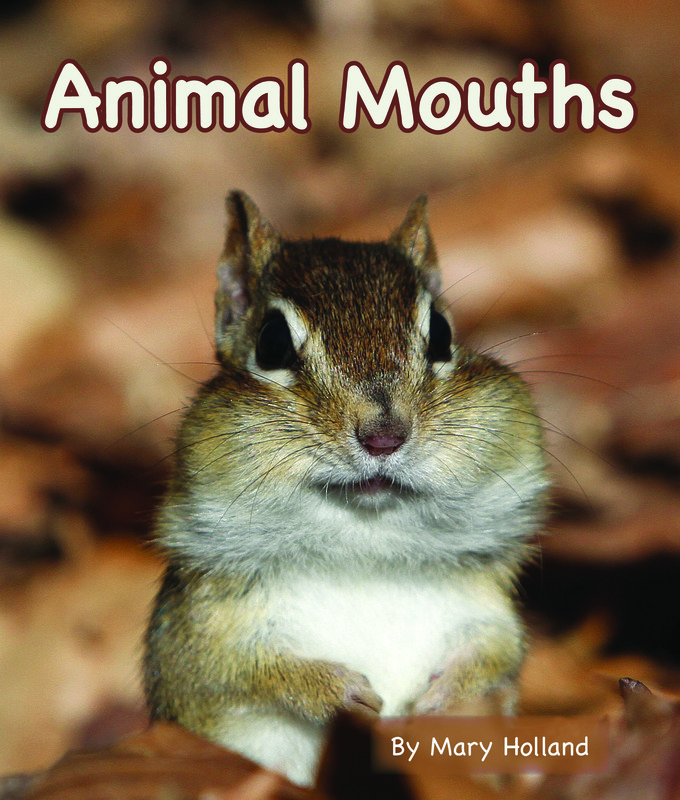 There is much to admire about opossums: they are the only North American marsupial, they have more teeth than any other North American land mammal (50) and they possess a prehensile tail and opposable thumbs (both of which are rarities among non-primates). The recent discovery of a road-killed opossum provided me with an opportunity to examine its feet at close range. An opossum’s front feet have five toes, each bearing a nail. Their hind feet also have five toes, but only four of them have nails. The fifth toe, or “thumb,” lacks a nail and is opposable, allowing opossums to grasp branches and to climb. 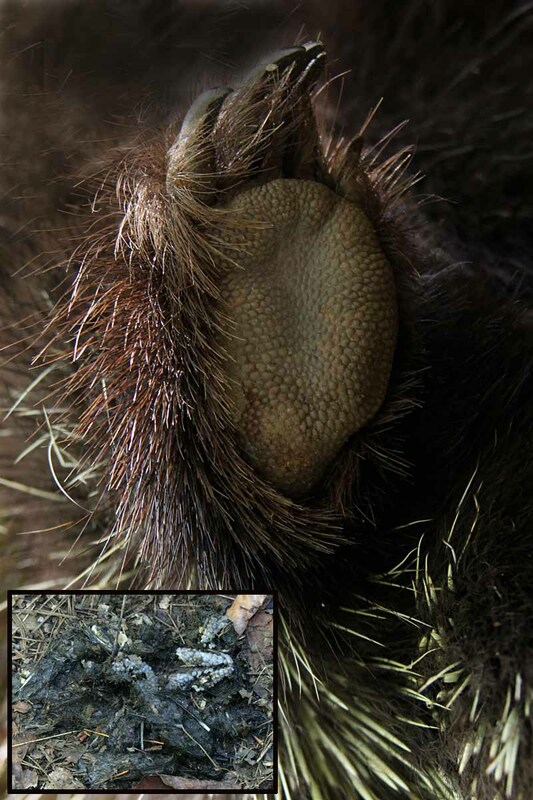 If you see their tracks, the hind foot is easily discernable from the front due to the fact that the thumb is at a 90-degree angle to the other toes. 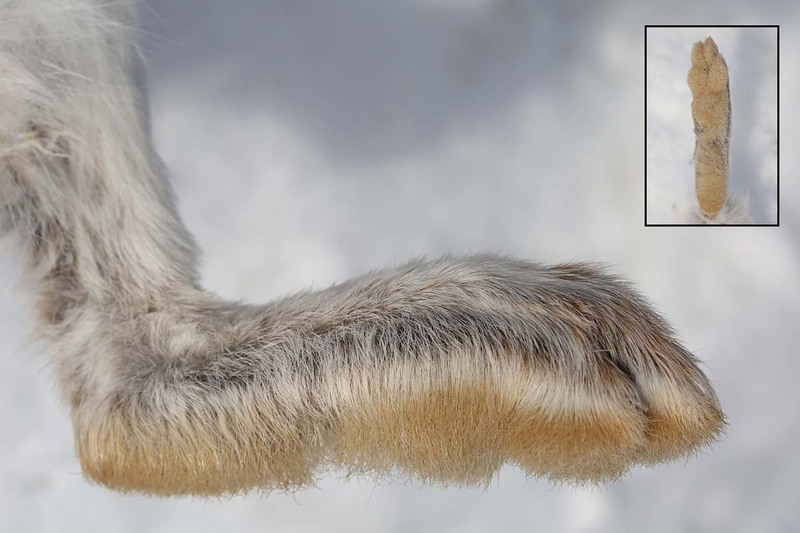 It is not hard to see why the individual toe pads in the tracks of a snowshoe hare’s feet are rarely very distinct. There is a 3/4”- thick layer of hair on the bottom of a hare’s 5- to 6-inch-long hind foot. This hair, along with the size of the foot and the ability of the hare to spread its toes to a width of five inches allows the hare to stay on or near the surface of the snow, and, in the right snow conditions, outrun heavier predators. Meadow Voles (Microtus pennsylvanicus) and White-footed Mice (Peromyscus leucopus) are two of our most common species of small rodents, and they both remain active in winter. Their feet are roughly the same size (approximately ¼ ” wide by ½” long), but the tracks they leave differ slightly, due to their differing gaits. White-footed Mice bound, leaving tracks that have a four-print pattern (parallel larger hind feet in front of smaller, parallel front feet) often with a long tail drag mark in between each set of tracks. Meadow Voles have a variety of gaits, the most common being a trot, which leaves an alternate-track trail, with the hind feet directly registering in the tracks of the front feet. Although voles can also leave a tail mark, they do so much less often than mice. 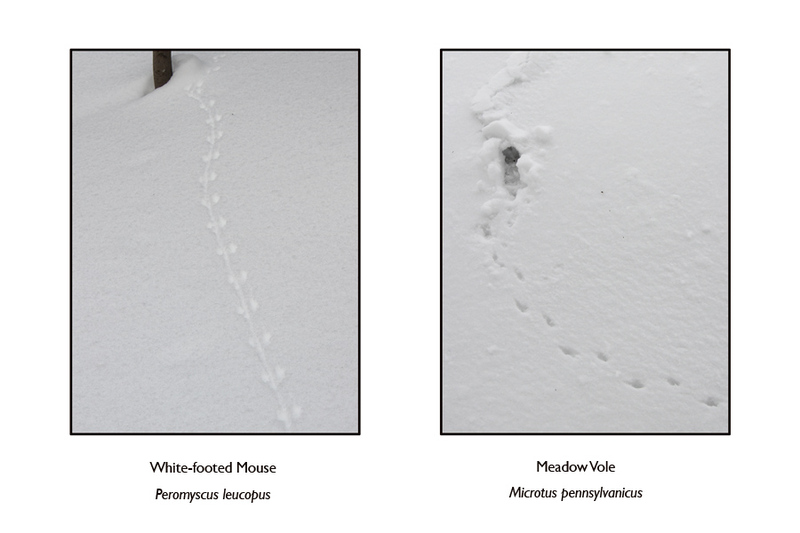 Once the depth of the snow is significant, mouse tracks are more common, as voles tend to travel primarily through tunnels they’ve created under the snow.